A star at my head and presents at my feet. You’ll remember me in my Christmas dress. But I’m remembering last Christmas. Then hurried on across the white meadow. My presents, a pair of finches huddling close in my branches. For a carol, only the hooting of an owl. And overhead a million stars to light my Christmas night. 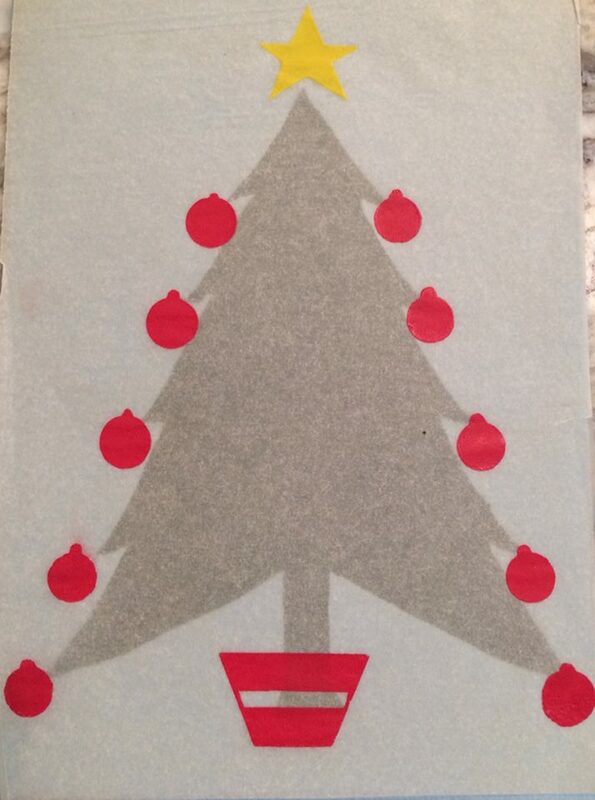 The card was homemade, with a silkscreen graphic of a simple Christmas tree. It was done in two layers: the green tree on a blue card stock, and the red ornaments, tree stand and yellow star on onionskin attached and overlaid on the blue. It has a handwritten note on the right and back panels next to where this poem is neatly printed and attached separately. It is dated December 8, 1976. It is a Christmas note from Jana to Aunt Sr. Carolyn when she was home for the winter break during her sophomore year at Iowa State. It may have taken me a while, but I am at last answering your letter! I ended up with an “A” in my physics class, which I still don’t quite believe, but I’m nonetheless proud of it. I changed my major to Leisure Services (alias Recreation) at the beginning of this quarter. Hopefully it won’t change again before I graduate! Not much exciting is going on around here. While I was home I got my driver’s license – finally! My first “solo” driving job came about 3 hours after I got it! Some nerd hit our dog with their car and didn’t bother to stop. Since no one else was home, I had to run him to the vet. He was really lucky. He only had to have part of his tail amputated, and his foot bandaged for a while. That’s all the major news from the front! Take care and have a super Christmas! It came to me in another envelope of memories from Aunt Carolyn this week. There is another longer letter Jana wrote to her in 1982 that I will share at another time, but I wanted to share this one because of the memories it jogs for me, and the question it begs from me. It is so Jana! Handmade. Silkscreened. In her time at ISU (1975-1980) she silkscreened so many pieces like this. She belonged to something called the Hawkeye Recreatory and every year the cover of their annual looked something like this card. It was a craft she learned in Girl Scouts and always loved. She had made her own silkscreen frame, so she could make her own cards and stationery. She’s a printer’s daughter after all! The poem she quoted about the Christmas tree reminds me of a story we learned years later called “Alfie, the Christmas Tree.” John Denver wrote that story and you can just picture the tree in a glorious winter life on the mountain or in the meadow, offering its own worship to the creator who made it, in celebration of his incarnation at Christmas. Oh how Jana loved – and still loves! – the mountains and the meadows. That’s what drew her to Colorado. The quick note in her neat handwriting brings back that fall and winter of 1976. Jana had refused to take driver’s education in high school and so was forbidden by our dad from getting her driver’s license and driving the family car. “It’s stupid!” she declared in her sure-of-everything Jana way. Somehow it wasn’t so stupid once she went to Ames for college. She took it there and thought it was great, worthwhile even. I was drafted to drive the car out to her one day when I had a day off of high school here in Omaha so she could take her driving test and get her license in Ames. (I didn’t think driver’s ed was stupid. I took it in the summer before my sophomore year and passed, enabling me to get my driver’s license in 1974! I could drive Jana when she was a senior in high school, but she couldn’t drive me.) Through a series of Three Stooges-like events, our car didn’t pass the inspection in Iowa. We got the problem taken care of (headlight was out!) and by the time we got Jana back to the testing station, it was closed. My trip to Ames went for nought and Jana was, let me say, not amused. But several weeks after that, Jana borrowed a friend’s car, took the test and passed. That must have happened right before she came back to Omaha on a quick trip. She probably got a ride into Omaha from a friend, and so her first solo ride was in our VW squareback with the Road Runner sticker on the back. We all took turns driving that car, including Mike, who I have said before was driving it before any of us…and he wasn’t doing it with license or parental permission at his tender age of 13. The dog I remember well: Tiny, our little chihuahua/terrier mix. I remember him making his way home in terrible condition, his foot in tatters and his tail hanging by a thread. I didn’t remember that Jana took him to the vet, but obviously she did from this note written at the time. He was bandaged up and had just a stump of a tail after that. He still wagged it just as hard when any of us came home. He was such a good dog. He paid the price for our lack of pet responsibility seven Christmases later when he was hit by another car on Christmas Eve. That was when Jana was back living at home, ten months after the train hit her. And we were all devastated. Even through the sad images this card conjures up in my brain, I look at it and smile. Jana was always good about writing to SAC and keeping her in tune with what was happening in her life. Ames wasn’t that far from Dubuque where SAC lived, and Jana took many trips that way during her five years at ISU. And the card is just so…Jana. The writing is neat. Her humor in telling a story is there. Her blunt honesty (nerd!) shines through. She doesn’t hold back. She has found her calling in leisure services, a way to live in the mountains and meadows and make a life from it. There is also something that is not in the card: an expression of the faith that Jana came to call on sometime in her years at ISU. Sometime after this Christmas of 1976, Jana discovered that she did love God, and he loved her. I don’t know when, or how, or through whom, but someday I hope to learn. Because ultimately it was Jana who gave that gift back to me. And so here on a day in September, I am experiencing a little out-of-season Christmas. Jana is sitting right here in the room with me and through Sr. Carolyn’s intermediary powers, has given me this gift from across the years. And in the irony and happenstance of life, I am the one driving her once again. It’s the least I can do in response to the greater gift she has given me.